The file manager tool is where you'll manage all of the materials that you need to build your pages, posts, and emails. 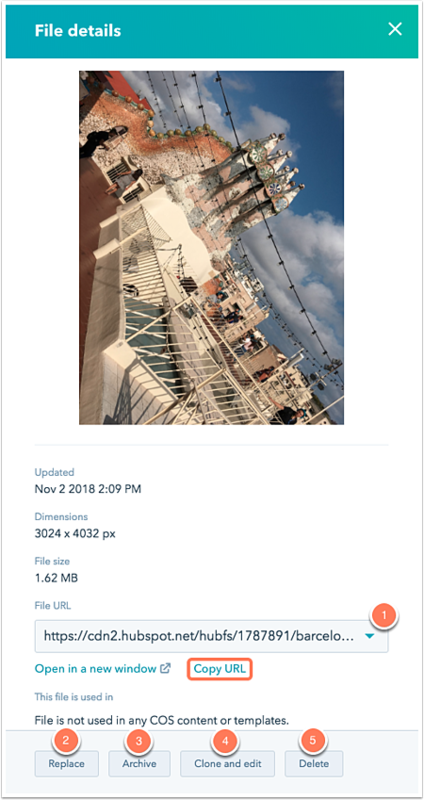 Use the file manager to upload and host PDFs, images, fonts, videos, audio files, and any other supported file type on HubSpot's content delivery network servers. In your HubSpot account, navigate to Marketing > Files and Templates > Files. If you have a Marketing Hub Starter account, navigate to Marketing > Email, and click the More tools dropdown menu in the left sidebar menu to select File Manager. Click Upload files to browse your computer's hard drive for files to upload. You can also drag files from your hard drive to the open file manager window and release. It's possible to upload multiple files, and upload time depends on the size of the file. If you have any trouble uploading your files, make sure you're uploading a supported file type. You can also upload files from within the content editor of a blog, page, or email. In your HubSpot account, navigate to Marketing > Files and Templates > Files. In the upper right, click Create folder. Give your folder a name, then click Save. You can upload new files in this folder, or move existing files into the new folder you've created. Use the search bar at the top of your file manager to look up a file by name. To filter for archived files, use the Active files dropdown menu. If you'd like to export a copy of all files in your file manager, click Export all files in the upper right of your file manager dashboard. Hover over the file in your file manager. Select the folder where you want to move this file, then click Move. Update the file name, then click Rename to save your changes. Select the checkboxes next to the files you want to modify. Click Yes, delete to confirm your choice. File URL: get the URL to link directly to your file. To change the domain your file URL is hosted on, click the File URL dropdown menu and select one of your connected domains. Click Copy URL to copy the file URL directly to your clipboard. Please note: by default files are hosted on HubSpot's content delivery network system domain, with cdn2 appearing in the domain of the file URL. You can update your settings to host all files on one of your connected subdomains. Replace: to replace an existing file, click Replace. Browse your computer hard drive and select a new file to replace the asset in your file manager. The old file may be cached on HubSpot's CDN for up to two hours after it's replaced, so you may not see the file update immediately. Archive: if you want to hide a file from appearing in your file manager, click on the file name and click Archive in the sidebar pane. An archived file can still be accessed at its public file URL. Clone and edit: to modify an existing file, click Clone and edit to launch the photo editor tool. Make edits to the clone of your file, then click Save. Delete: to permanently delete a file, click Delete, then click Yes, delete file.